"Today is my last day as Violet Lasting. Tomorrow I become Lot 197." 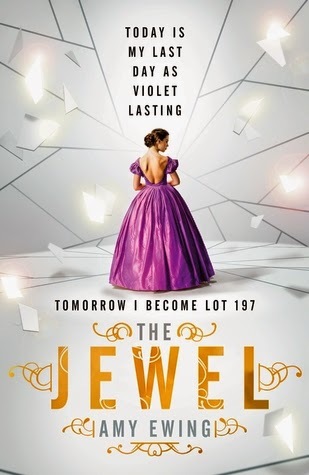 The Jewel is a shocking and compelling new YA series from debut author, Amy Ewing. Sold for six million diamantes, Violet is now Surrogate of the House of the Lake in the centre of the Lone City, the Jewel. Her sole purpose is to produce a healthy heir for the Duchess – a woman Violet fears and despises. Violet is trapped in a living death, her name and body no longer her own. She fights to hold on to her own identity and sanity, uncertain of the fate of her friends, isolated and at the mercy of the Duchess. The Handmaid's Tale meets The Other Boleyn Girl in a world where beauty and brutality collide. The jewel was a really interesting read for me for a variety of reasons. Firstly I loved the world set up around the main character Violet. When the reader meets Violet she is about to be sold to the highest bidder at auction to act as a surrogate for a wealthy family who are unable to have children of their own naturally. The ideas behind the story were really dark and often left me feeling quite uncomfortable. As a reader you get a real sense of the horror Violet faces and it is a really disturbing read for that alone. However for me there were too many similarities to other books in the YA market which didn't make it feel original. There are shades if the hunger games in the relationship Violet has with the young man who preps her for auction and the extreme poverty faced by Violet's family in a world where the rich lives in such extreme wealth. There are shades of the selection in the world setting and the themes involving the royal families. The ideas around using young women to produce children for the very rich felt very much like Wither. For me what I needed is for those bits that made the book unique to have a bit more development. The girls who could produce children appeared to have some kind of supernatural powers which I wanted to know more about because I didn't understand them from the vagueness given in the book. I absolutely hated the fact that the book decided to include a forbidden love interest for Violet. I didn't think it was necessary and for me it slowed up the story overall. The ending finishes on a huge cliffhanger which is another real pet hate of mine with first books in a trilogy mostly because by the time I get to book 2 any impact the cliff hanger had will have gone because I will have forgotten book one. All in all an interesting read which had some potential but book two needs more originality, pace and questions answered to keep me interested in the series.